Supplementing the natural enemy population to control insect pests, i.e. 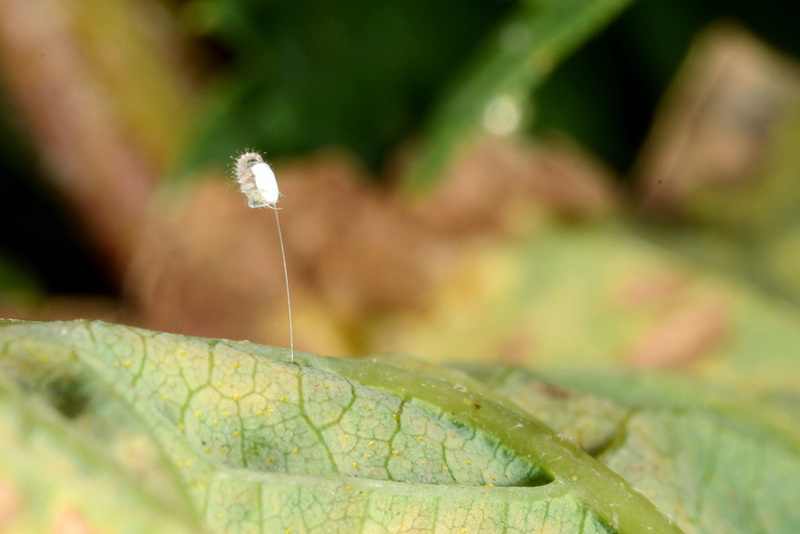 augmentation biological control, is of interest to many high tunnel producers. Augmentation biological control has proven very effective at managing a number of greenhouse pests and there are a variety of commercial suppliers. For high tunnels, the greatest challenge is keeping the released predators or parasitoids inside the tunnels and choosing agents that are effective under high temperatures, during the peak of the growing season. We have evaluated some of the more common control agents in high tunnel cucumber and tomato production. 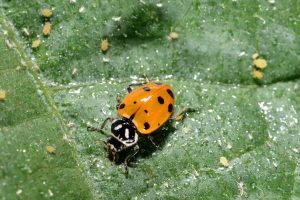 The convergent ladybug, Hippodamia convergens, is not grown in a growth facility but rather caught in the wild in the western U.S. (typically California) and shipped throughout the US for control of aphids in particular. They are a fairly inexpensive predator (1500 for about $15.00), the immature form (larvae) and adults feed on aphids (Figure 1). However, you can only purchase adults and their availability can be limited. Furthermore, they do not stay in tunnels, less than 4% of those released were recaptured in two days. 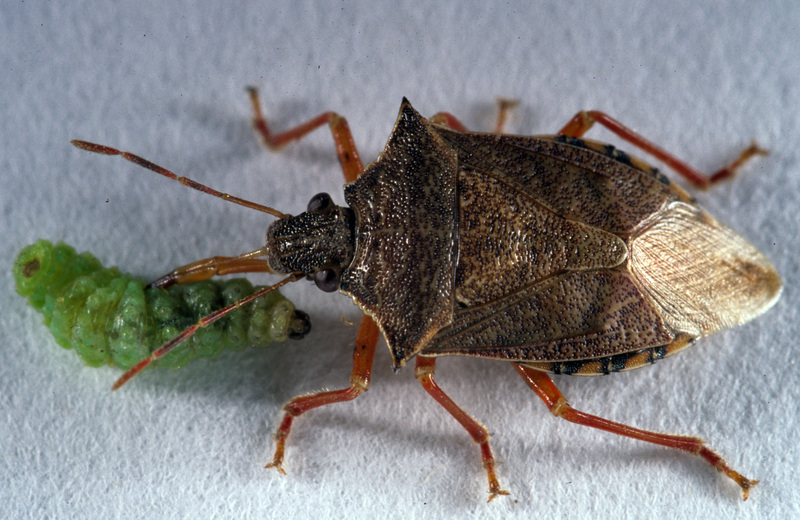 The predatory stink bug, Podisus maculiventris, (Figure 2) is grown in colony for commercial availability. The immature nymphs and adults feed on small caterpillars. They can occasionally be found in tunnels naturally in the region; we have observed them feeding on caterpillars on tomato and cucumber crops. Adults are fairly expensive to purchase (50 count = $90-150) and have retention rates around 3% two days after release. Eggs may be purchased and released in tunnels (250 = $60-120) but take 2-3 weeks to hatch before any predation will occur. I would not recommend relying on this predator for control. Figure 2. A stink bug eating a spined alfalfa weevil larva (Photo by John Obermeyer). 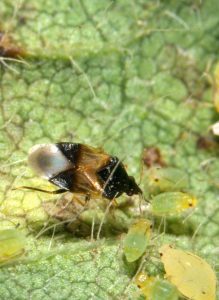 The minute pirate bug, Orius insidiosus, eats thrips, mites, aphids and caterpillar eggs and small caterpillars (Figure 3). They are grown in colony for commercial release but are also very common later in the growing season in Indiana. The price ranges from $55-80 for 500 depending on supplier. Their retention is a bit higher than ladybugs, but can be enhanced by providing extra floral resources and using herbivore-induced plant volatile lures (such as PredaLure®, AgBio®). Use caution if deploying them in tomatoes, they get caught in the sticky hairs on the plant. Figure 3. A pirate bug feeding on aphids (Photo by John Obermeyer). The most promising agent to control aphids appear to be green lacewings (Figure 4 and Figure 5), Chrysoperla carnae. These are available for purchase as eggs, larvae or adults. The predatory life stage are larvae, which feed voraciously on aphids. If you have a current infestation that you are trying to control, you should purchase this life stage, as they will be able to immediately feed on the aphids. If you are putting them out as a preventative measure, the egg stage is a more economical option (1000 eggs = $15, 1000 larvae = $20-38, 100 adults = $45). If purchasing adults, expect them to leave tunnels at rates similar to ladybugs, but after laying eggs. Most important when considering using biological control in your high tunnel is the compatibility with growing practices. Heavy pruning of the lower leaves on both tomatoes and cucumbers may be removing the predators you just purchased, especially lacewing eggs which are preferentially laid on the lower parts of the plant. Routine scouting and monitoring of both pests and beneficial insects will be required to evaluate efficacy and track populations. Figure 4. 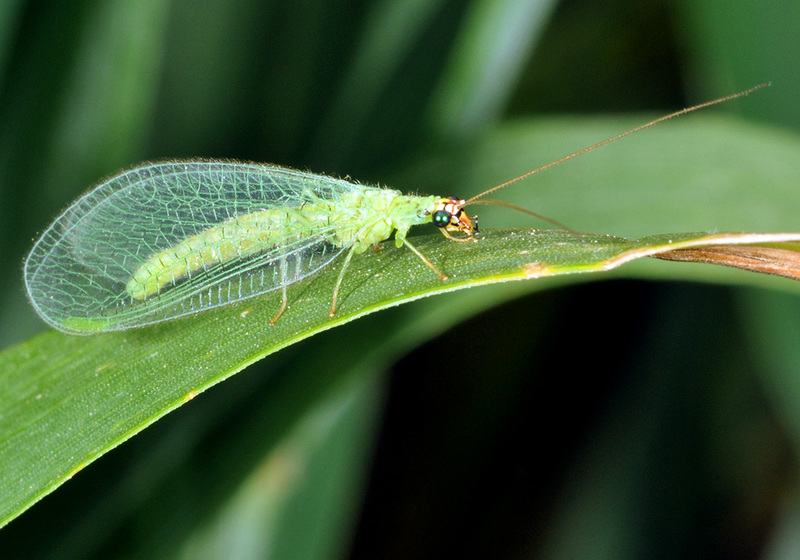 A green lacewing adult (Photo by John Obermeyer). Figure 5. A green lacewing hatching from its egg (Photo by John Obermeyer). Lastly, we have gained control of both armyworm and hornworm caterpillars on tomato and cucumbers with application of the biological Bacillus thuringiensis (Bt). This would be an alternative to conventional chemicals or predatory insects and is effective at suppressing caterpillar pests within days of application.